So, last week I went to the cinema to see Jurassic World: Fallen Kingdom, and decided to give 4DX a go. It only just became a thing at my local Cineworld so it was my first time. *Just a side note, my local Cineworld has been making changes recently, so as well as 4D, they also have some screens with fabulous reclining chairs that make you feel like you could be sat in your living room. Anyway, I went in for the 4DX screening and I was immediately struck by how big and plush the seats looked. I must say that I definitely wasn't disappointed; however unlike the reclining chairs in the other screens, it soon became apparent that this was going to be nothing like my living room. The 3D was what you'd expect, but even though I knew what the 4D was going in to it, it still came as a shock when my chair started moving. But the real surprise came when the rain started on screen and all of a sudden I was getting rained on and then the wind picked up. I don't know what I expected when I read the description of 4D, but what I got was a crazy ride that even included the feeling of rubble falling at my feet. It was really exciting being thrown around and exposed to the elements, although if you decide to go, I would definitely recommend a cardigan or jacket of some sort. I was pretty cold by the end of it since the rain and wind were general coming at the same time, leaving me feeling like I was actually outside. Overall it was an enjoyable experience, but I did feel that to some extent it distracted me from the film, so I will probably need to go see it again to fully appreciate it, but without the added extras next time. I have a Cineworld Unlimited card (which I would highly recommend to anyone who loves films) so I only had pay the upgrade costs, but without it the 4DX would be fairly expensive, so you'd have to decide for yourself whether you think it's worth it or not. So, in short, I really enjoyed the experience. It was fun and a bit of something different, but for the most part I think I'll be sticking to normal 2D, 3D, or IMAX. Goodness, that sounds like quite an experience! I'd love to give it a go although I get cold really easily so thanks for your advice about bringing a cardigan or something similar! Oh my goodness I just love the fancy chairs at my local cinema. I can't wait to go back and sit in then again! It sounds like you had a lot of fun! I have been to a 4DX experience once, in London, but the movie was just 5 minutes long. I do however remember the wind and the rain. It was so funny. I went to see Star Wars in 4D and it was a fun experience but I definitely agree with you Nicola, a cardigan or even light rain jacket is highly recommended! I was freezing towards the end of the film! I also couldn't help feeling that certain scenes were possibly engineered to demonstrate the 4Dx effects and the film could have actually done without them. 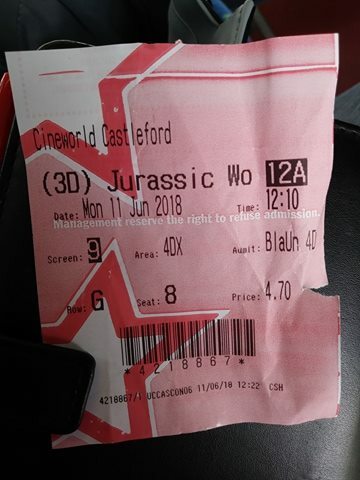 I can imagine a Jurassic film would be awesome to watch in 4Dx though! Whilst it really is good fun to try, I don't think I'd like to watch all films in 4Dx as the effects are a little bit distracting. Big comfy chairs are awesome though aren't they? I definitely see what you mean about being distracted from the film with all of that going on! I bet it was a great experience but maybe I'd do that with a film I'd already scene, so I could experience the sensations more because I already know what's going to happen!